PERFORMANCE: From day one Bonnevilles have been built to be ridden, not just to look good. Today, this 865cc parallel twin puts out a healthy 68PS with 68Nm of torque at its peak, with plenty available at low revs so you get most use out of it. The fueling is controlled by a sophisticated management computer programmed for clean emissions and a smooth predictable throttle response. So there’s enough performance to be fun for experienced riders but not so much that will intimidate riders with fewer miles behind them. PRACTICALITY: Behind the classic looks and iconic engine lies a practical and modern all-rounder. Our confidence provides you with a two-year unlimited mileage warranty on your new Triumph and Genuine Accessories. Alongside the knowledge that we give you a 12 month unlimited mileage warranty on replacement parts. 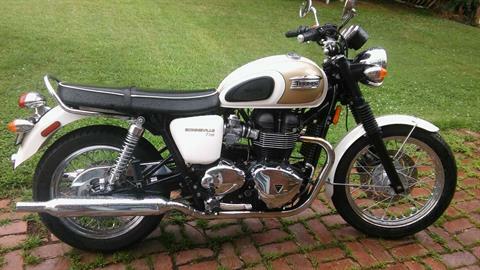 The Bonneville T100 carries 6,000 mile (10,000km) service intervals.